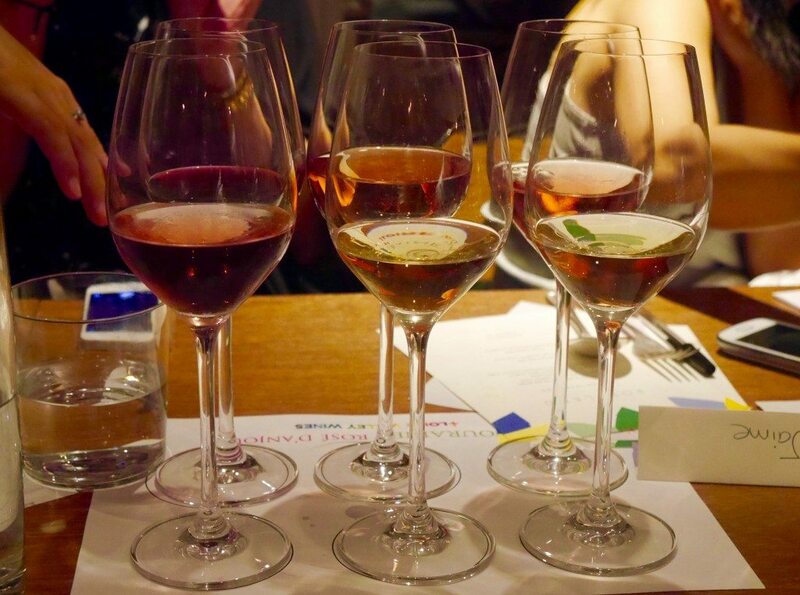 Last week I was fortunate to receive an invite from Square Meal to attend a wine tasting dinner at Portland restaurant in association with Loire Valley Wines. Street Vin’s Ruth Spivey and the Square Meal team paired up to host the evening, which was a huge success, drinkathon & feast. 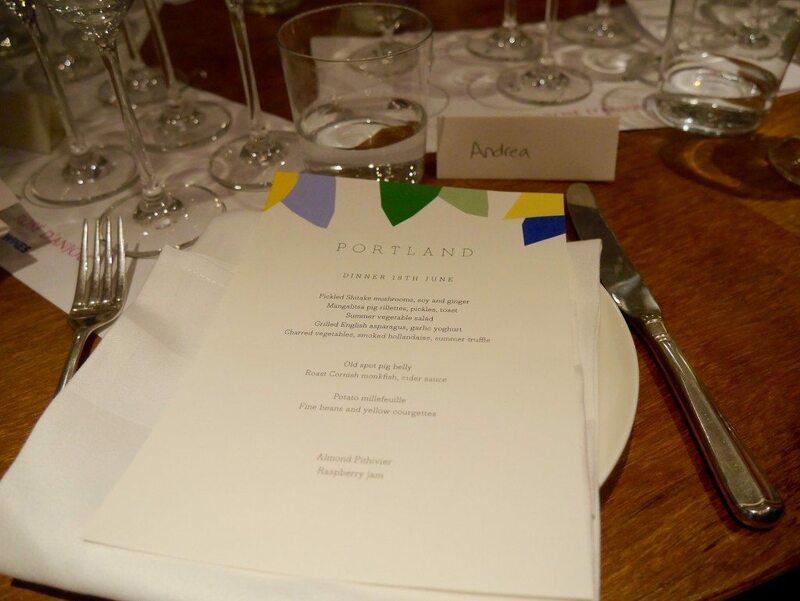 Portland is a relatively new restaurant, opening only at the start of this year. 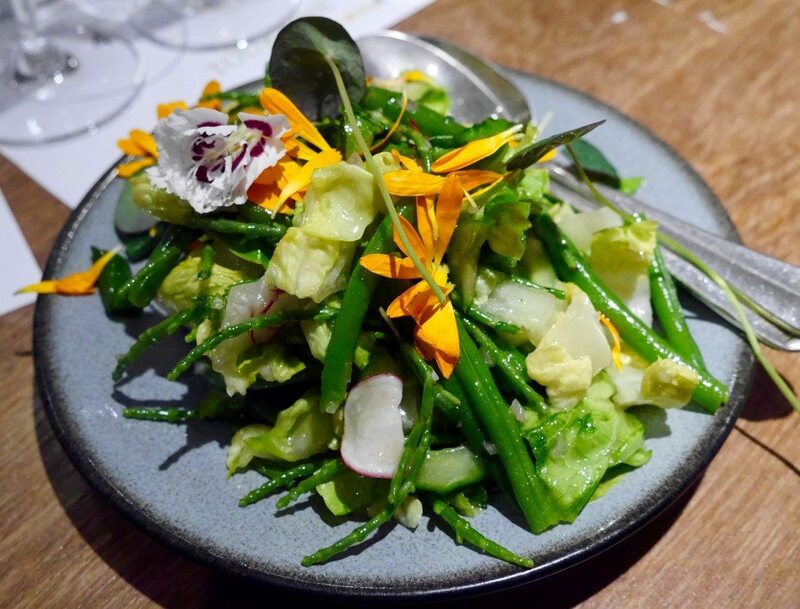 As a joint venture between two tremendous chefs, previously at the Quality Chop House and 10 Greek Street, it is unsurprising that they have chosen to adopt a seasonal ‘best of British’ menu “based on the best produce that they can find”, with a monthly changing wine list (much like at 8 Hoxton Square – 10 Greek Street’s little sister). The main dining room is very attractive; as an ex-clothing showroom, the dining space is rather wide, allowing plenty of natural light to flood the room. An open kitchen at the far end of the restaurant adds to the rustic & relaxed ambience. However, I only sneaked a glance before being led downstairs to the private room where we would be spending the evening. After a short & sweet meet & greet with the other attendees, I located my name card and took my place at the table. With 6 wine glasses allotted to each guest, glassware consumed the entirety of the table, and I started to mentally prepare myself for the heavy drinking ahead; good job I’d arrived dehydrated! 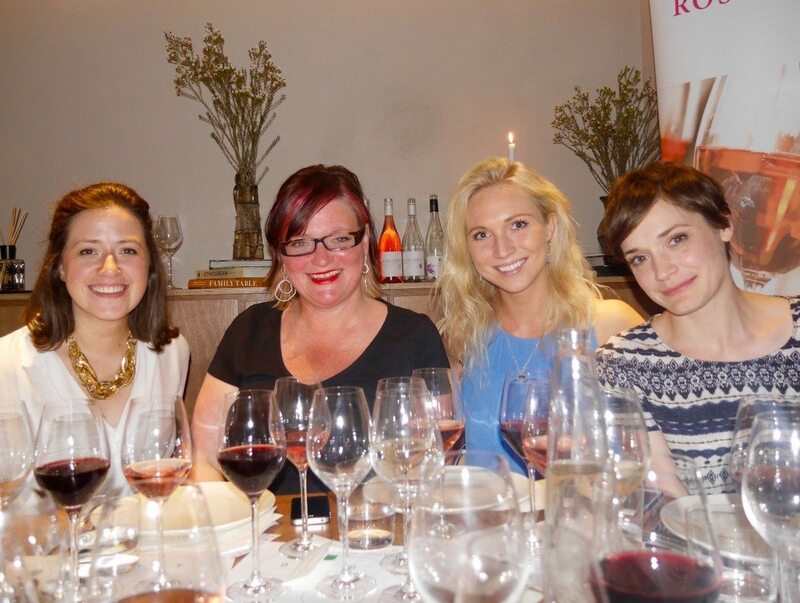 As much as I LOVE wine, some wine tastings can be a little (/extremely) dry & pretentious. But I need not have feared, as this event was truly great fun; Ruth kept her introduction of the wines short & to the point; she didn’t shove snobbish comments regarding notes and undertones of unheard of flowers & herbs down your throat; she was fun & relaxed, and I felt as though she was there to enjoy the food & company just as much as to share the wine, which meant that our meal and constant stream of happy chatter was never interrupted for a dull wine speech. But, most importantly, the wine flowed all night long. Top wine host, if you ask me. 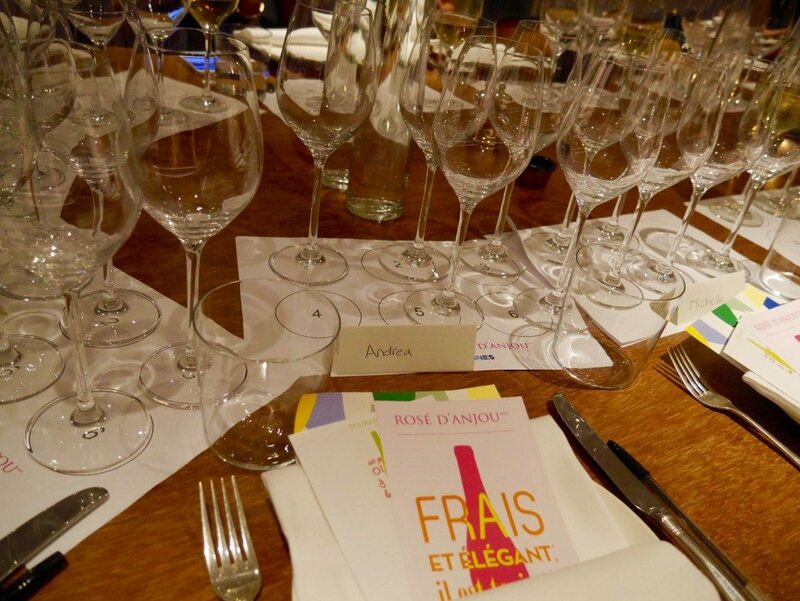 Our grand feast was to be paired with Rosé D’Anjou rosés and Touraine whites & reds from the Loire Valley. 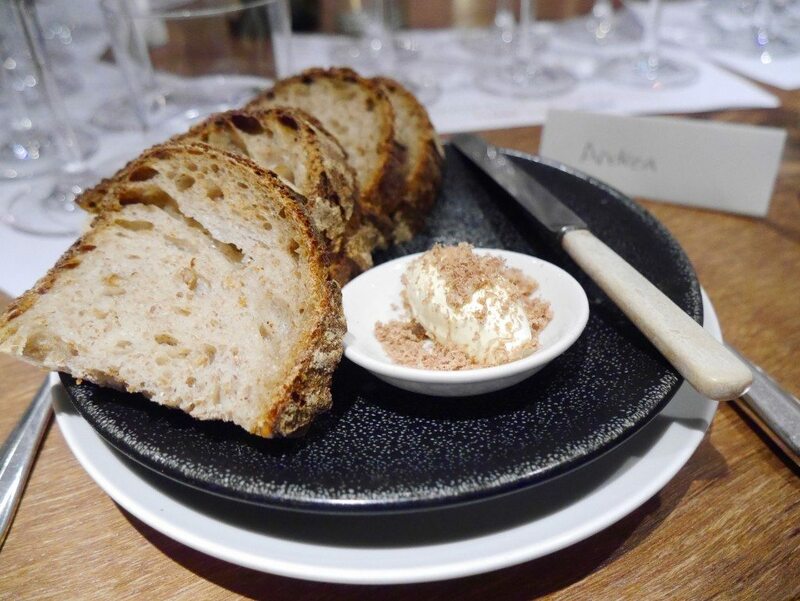 Bread was served and the first wine poured. I felt as though the Last Supper had truly commenced. 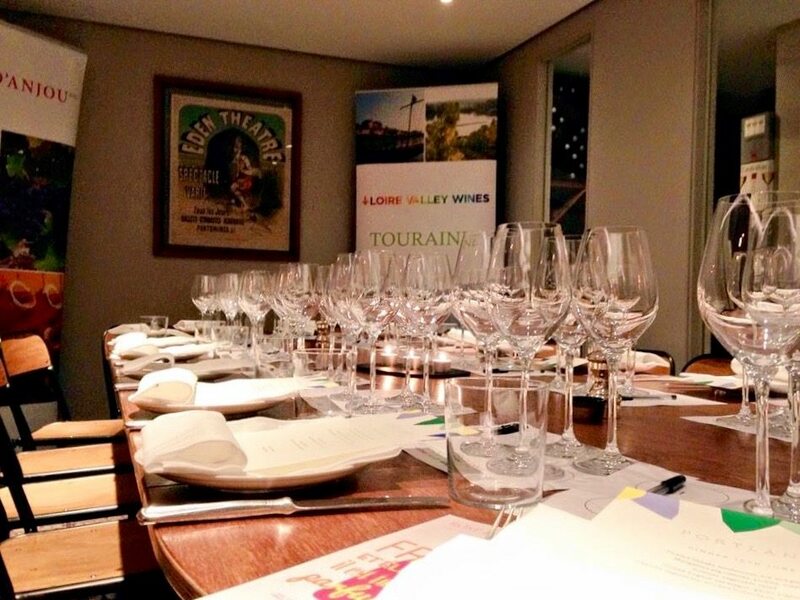 As soon as I took my first sip of ‘Domaine Bellevue, Touraine Sauvignon, 2014’ (£10.99), a huge smile grew across my face; it was just how I like my white – light & clean. This bottle turned out to be my favourite wine of the evening, which I happily guzzled with every course, despite intermittent sips of the other wines. 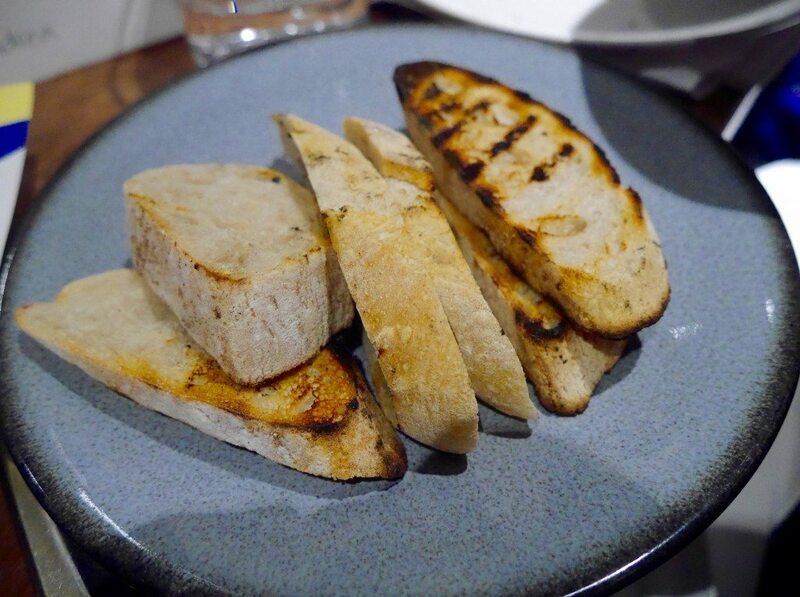 The bread was freshly baked and scrumptious smothered in the whipped butter; I sometimes wonder at this stage in a restaurant meal whether one really needs more than good bread & wine to have had an excellent meal – it’s often my favourite part! However, the ‘real’ food then began, by the bucket load. First up, Mangalitsa pig rillettes, pickles and toast. 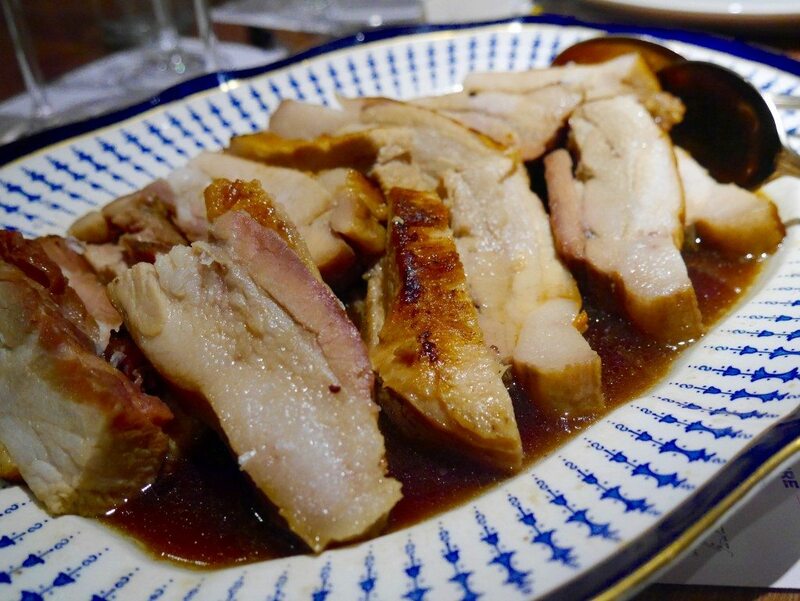 The texture of the slow-cooked pork was divine; not too smooth or too coarse, however, I couldn’t detect much flavour other than salt. Still, tasty spread on a bit of toast and enjoyed alongside sips of ‘Domaine de l’Aumônier, Touraine Sauvignon, 2014’ (£9.99). 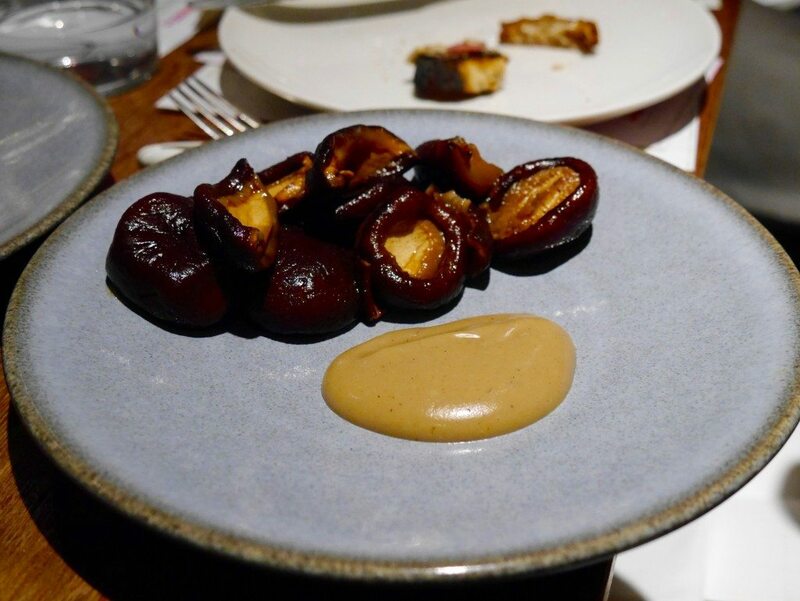 Then came the pickled Shitake mushrooms, soy and ginger, paired with ‘Domaine des Essarts, Rosé D’Anjou, 2014’ (£8.50). I usually steer clear of rosé as more often than not I find it too sweet & heavy. However, I’m always up for trying things with an open mind and, although I did find the wine on its own a little sweet, I must admit that it really did complement the mushrooms nicely. The sweetness of the wine cut through the (very sharp) acidity of the pickled mushrooms, making for a truly well-balanced combination. I really enjoyed this wine pairing & dish. 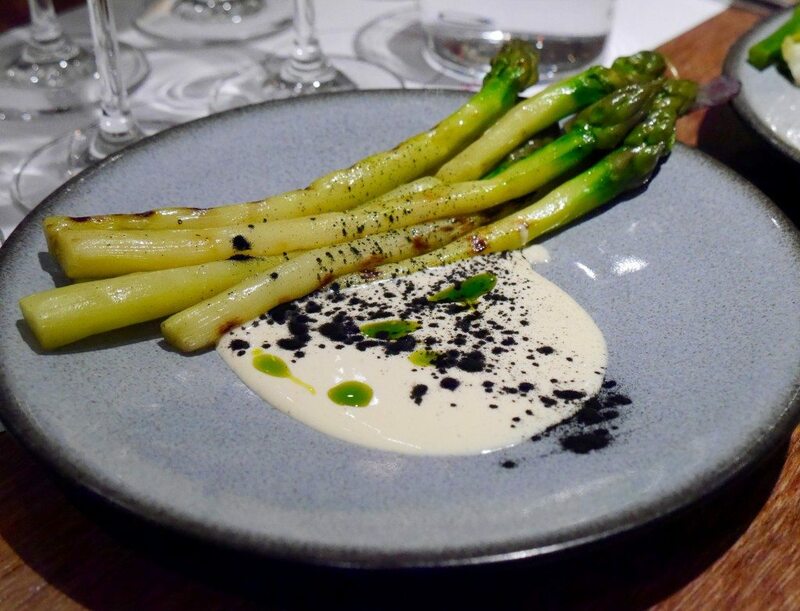 The next starter of grilled English asparagus with garlic yoghurt got everything right back on track. Although the asparagus was slightly more floppy than I would usually like, the sauce was heavenly. If you don’t know by now, I am the sauce Queen, and Portland was really on point with their sauces throughout the evening. Ruth compared it to kebab sauce; a comparison meant as the greatest compliment. 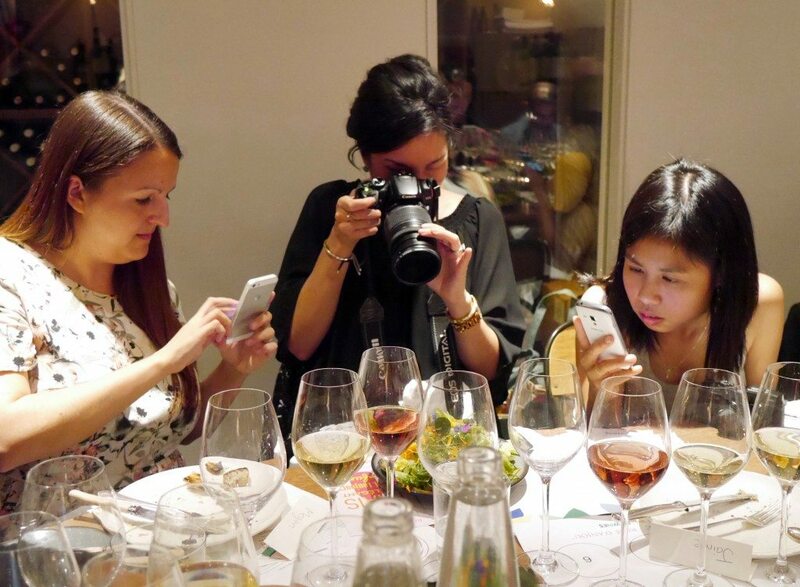 I must say that I really loved having dinner with a bunch of bloggers who were just as happy as me for the food to get (semi) cold in order to ensure the best possible shot! 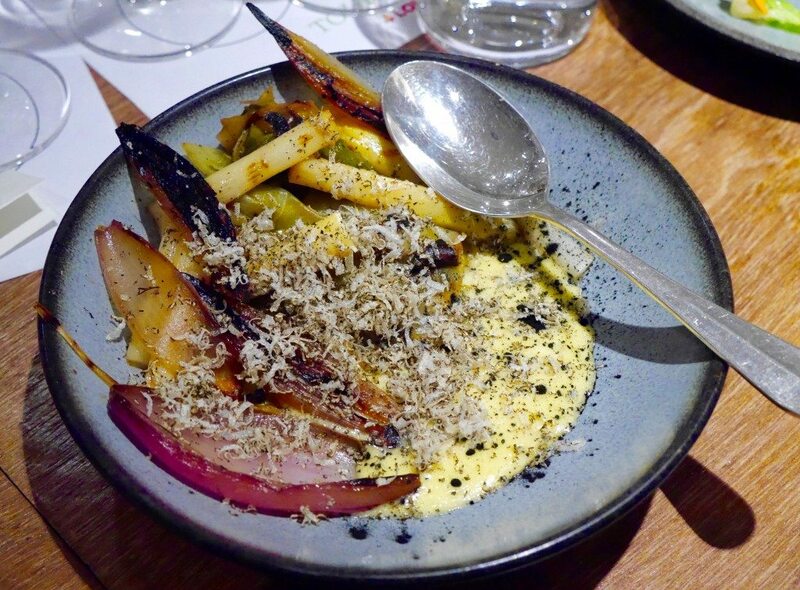 The charred vegetables, smoked hollandaise and summer truffle was my favourite of all the starters. Although the veg was nice (a few too many members of the onion family present for me to be in love); what really made this dish stand out was the smoked hollandaise, which was SENSATIONAL, so much so that I scavenged all of the remnants of bread left on the table to mop up every last drop. 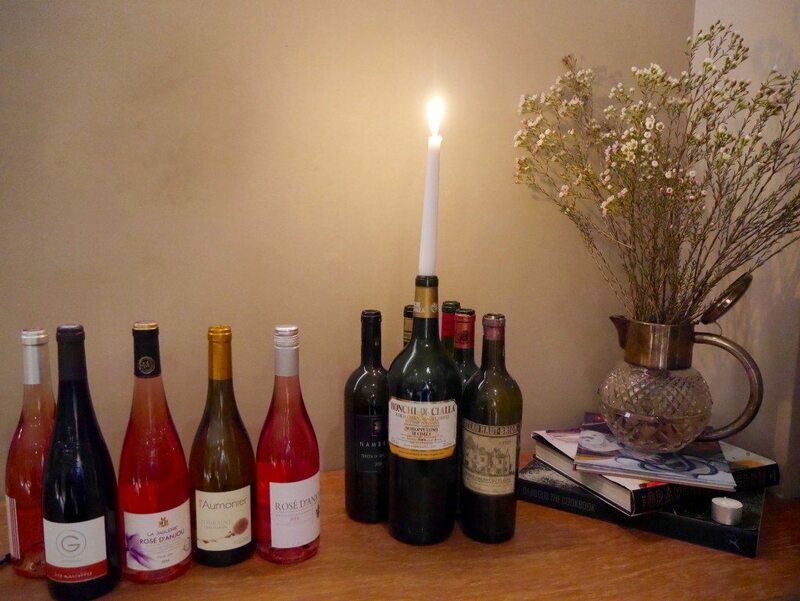 The fourth wine that we sampled, ‘Rosé D’Anjou, 2014’ (£8.00), was again sadly a little too sweet for me; although there are of course exceptions, I’ve come to learn (through trial & error) that I usually like white & rosé to be as light in colour as possible. In preparation for the mains, our glasses were filled with ‘Les Marcottes Domaine de Pierre, Lionel Gosseaume, Touraine Gamay, 2012’ (£9.95). It may have been the contrast from the light white that I was drinking, but this red tasted too heavy on the tannins for me to truly enjoy, so I stuck with my trusted white. I don’t think any of us were prepared for the amount of food that arrived; I suddenly thought it was Christmas! ^ Scuse the sauce ladling! Although I did enjoy my plate of food, the various elements were not nearly as well-executed as the starters, in my opinion. 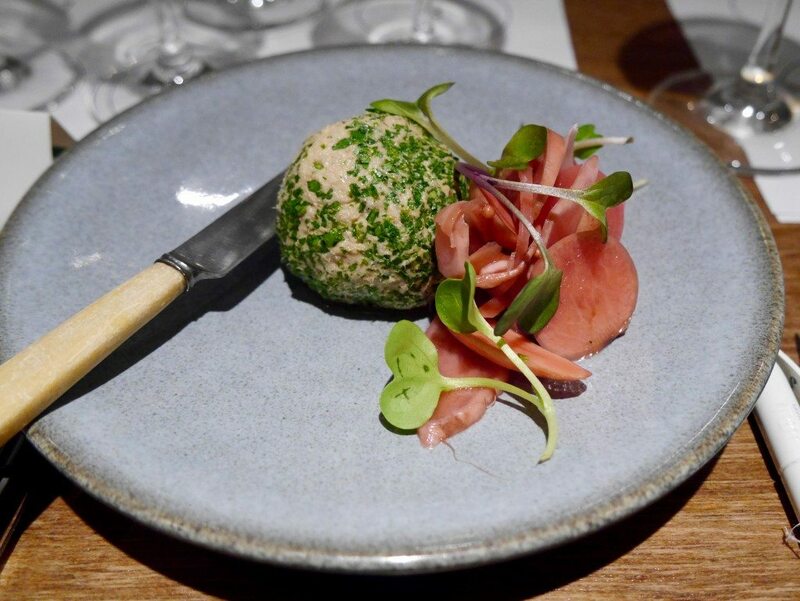 Starting with the old spot pig belly, the meat itself was dry with large layers of unrendered fat, unlike at Bob Bob Ricard, Eight over Eight, and Sushisamba, which have all got this dish down to a T! The sauce was also too thin but, for me, the worst sin of all was that there was no crackling!!! This broke my heart slightly. The roast Cornish monkfish with cider sauce was much better. 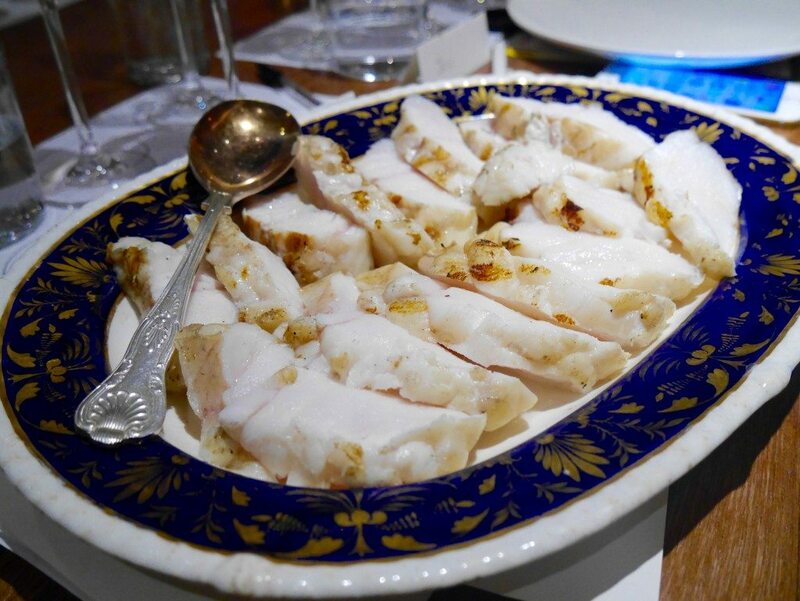 The fish was a little on the chewy side (but excusably it is tricky to cook fish en masse! ), however, the unbelievably moreish, thick, creamy cider sauce more than made up for a few extra chews. I drowned everything in it. 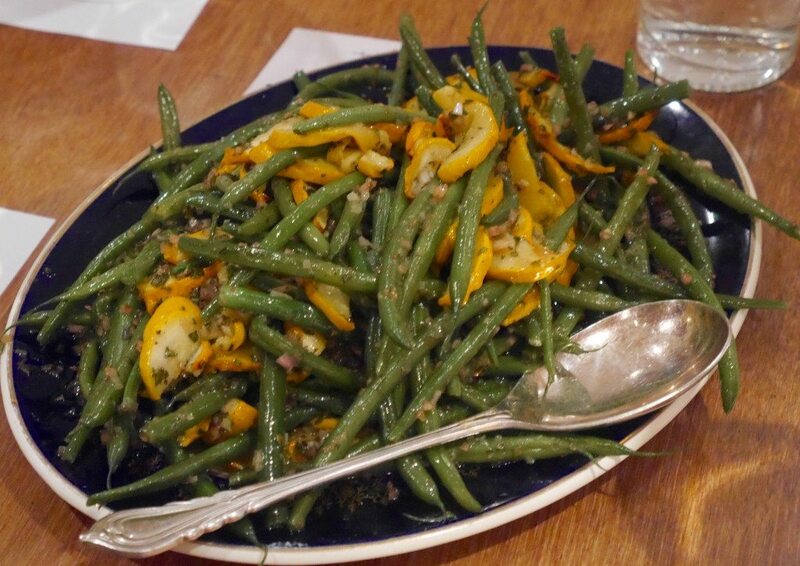 The fine beans and yellow courgettes were a nice side; flavoursome, well-seasoned and cooked al dente, as they should be. You will be pleased to know that I have saved the best till last, as the potato millefeuille, aka the ‘carb bricks’, were simply divine. 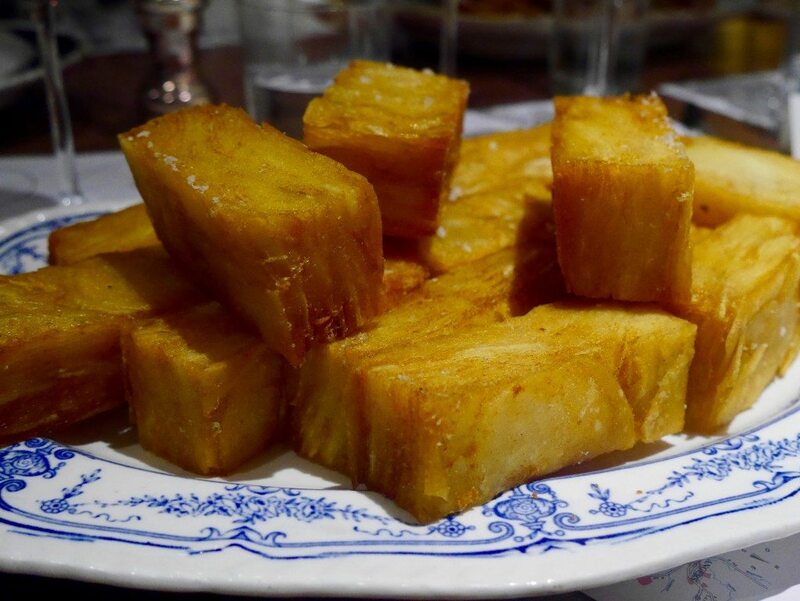 Delicately thin layers of moist potato encased in a seriously crisp deep-fried shell left me, and everyone else around the table, wanting more & more & more. They were definitely the star on everyone’s plate. And, just when we all thought that we were going to explode, the almond pithivier with raspberry jam materialized, paired with ‘La Jaglerie Marcel Martin, Lacheteau, Rosé d’Anjou, 2014’ (£7.99). The wine was much too sweet for my taste, but the dessert was a delight. 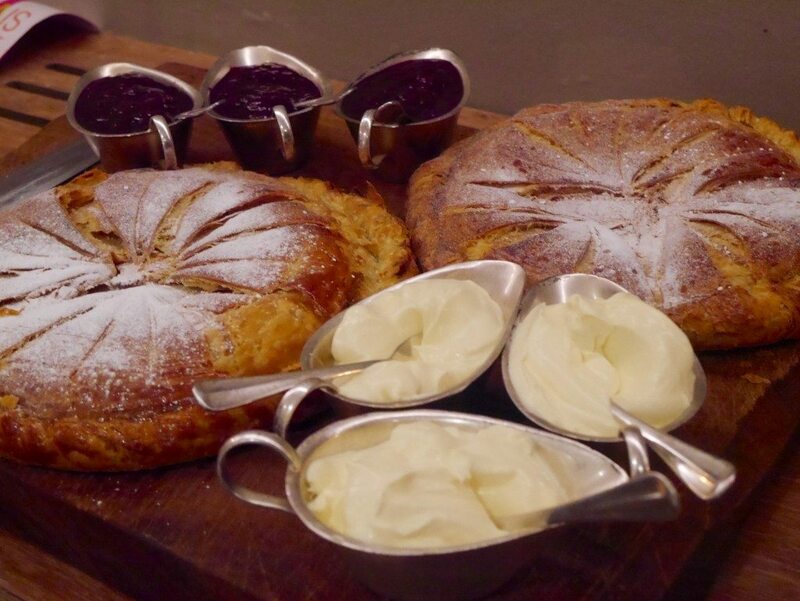 I’ve never had a ‘pithivier’ before, but it was buttery & rich, almost like a dense croissant, and quite savoury in flavour, but the seriously immense (distinctively) homemade raspberry jam & clotted cream brought sweetness to the party, and the three components combined made for a dessert dream. A great finish to (what my jeans seriously hoped would be) the Last Supper. More than merry & with a very full belly, we began to disperse and make our way home. But not before being given a very ‘unique’ goodie bag from Loire Valley Wines, containing two bottles of wine… a huge artichoke….. and a stick of rhubarb; definitely the most unusual party favours that I’ve ever received! The wines shouldn’t be tooooo much of a problem(! ), but every time I open the fridge I still don’t know what to do with that bloomin’ artichoke – tips much appreciated! I want to say thanks to the Square Meal team and Ruth for being such great, fun hosts; to Portland for feeding us so much wonderful food; the starters, potato millefeuille and dessert had me experiencing pure food joy; and to Loire Valley Wines for introducing me to a region of wine that is “trendy in geeky wine circles”, that I would probably never have otherwise tried. I had a brilliant evening. I dined as a guest of Square Meal, but all opinions are my own. Pork with no crackling?! WHAT IS THIS?! Looks like such a fun evening though! I can’t imagine it was a fun headache the next morning though…! Ahh what a shame I couldn’t come (though I was at The Dorchester Grill 😉 ) Looks like such a fun night and I really want to try Portland. I’m with you on the rose I’m not usually a fan though occasionally you find a good one and I do enjoy it on holiday! Not sure if could have coped with all the ‘pig’! I do not envy the hangover you must have had the day after! I’ve had the worst sweet tooth lately and that dessert looks delish 🙂 Sounds like a very fun evening! 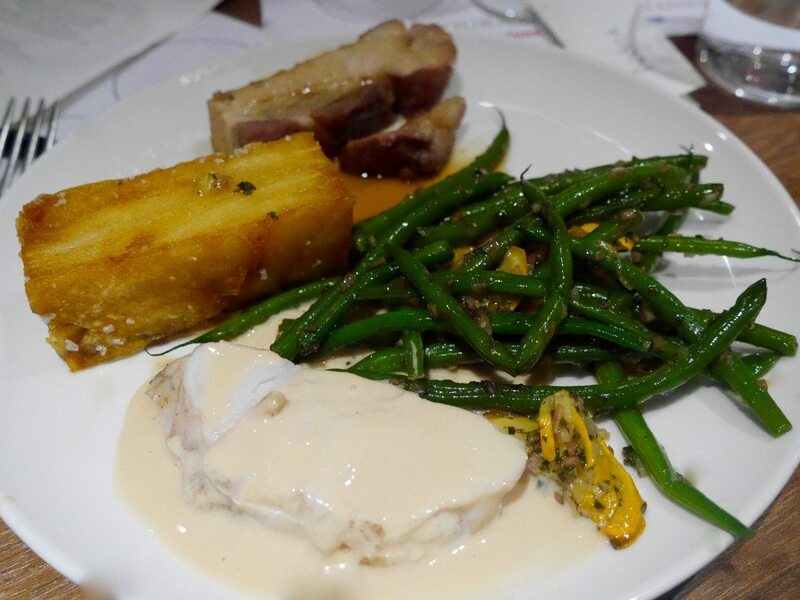 Gah… this post has made me even more disappointed that I had to pass on this dinner and wine feast! And I would have finally got to meet you too! Wow this looks incredible! Absolutely drooling. Ah you lucky thing, it looks like such a brilliant evening! It’s pretty much my dream to be out with people who agree that it is perfectly acceptable to hang upside down from the light fixtures to get a photo as I’m always way too embarrassed to really go for it and so always end up taking blurry little shots with bad angles haha. 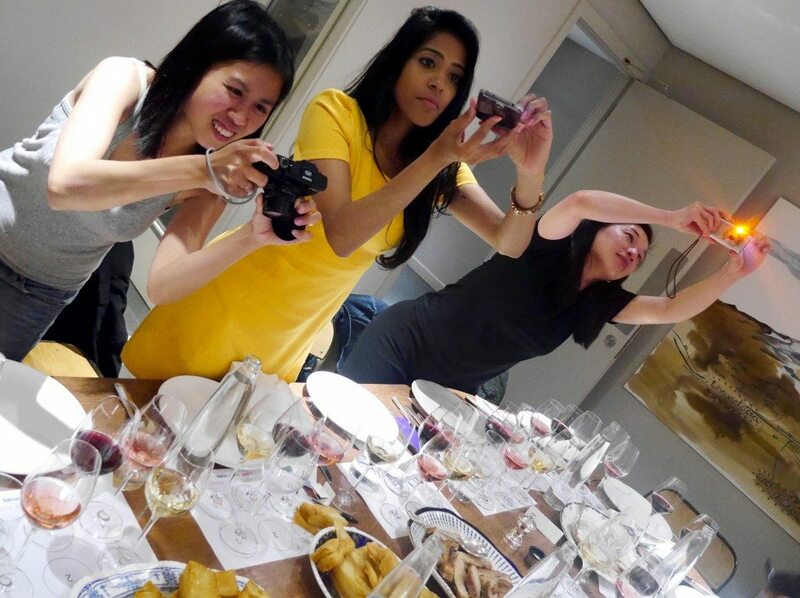 I seriously lolled at your pictures of the other bloggers photographing their food – this is reminiscent of so many blogger meet-ups that I’ve been to!! 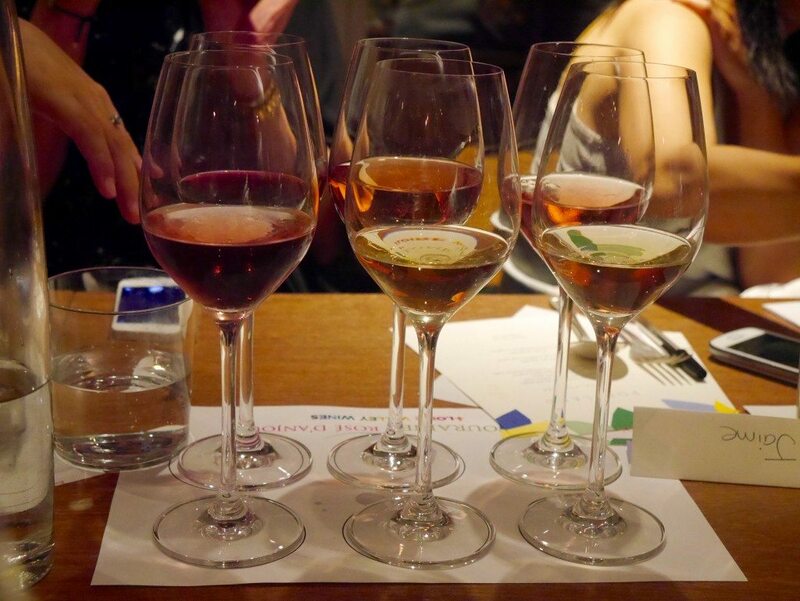 It’s always nice when you find one wine you love at wine tasting events – hope you’ve worked out where you can buy it so you can have it again!